The original Hanging Bubble Chair was designed by EeroAarnio in 1968. With this chair, ‘hanging out’ with friends can be taken to a whole new level. The Hanging Bubble Chair allows one to defy gravity and tradition in one fell swoop. As you are suspended from the ceiling , you are enveloped in a non-claustrophobic hanging bubble that can rock, spin, orbit or swing as you please. This transparent and surprisingly comfortable bubble based on the original supernatural design of Aarnio,enables the enjoyment of ‘sitting’ along the same lines as the old swing on the front porch – but with a metro twist. Besides, you can use it all year around and never once need to light up a mozzie candle! Suspended from the ceiling, this chair is simply out of sight, thanks in large part to its transparent acrylic sphere that gives it its name. EeroAarnio was inspired by dome shaped skylights and asked the manufacturer if it was possible to blow a bigger bubble. The answer is before you!Eero added a steel ring for strength and installed a set of cushions for comfort so you can laze the day away in swirling, swirling comfort. 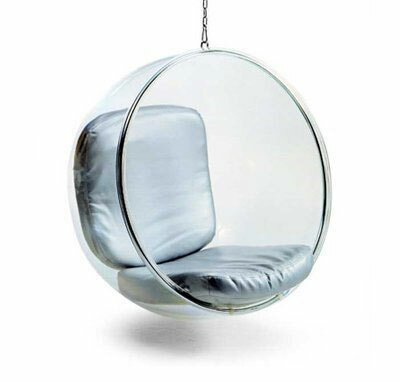 While this chair is not the original EeroAarnio Bubble Chair – it is an excellent reproduction and very much like it.Original versions of this anti-establishment chair can cost an arm and a leg, but smart shoppers wanting to hold onto their limbs can get a high quality Hanging Bubble Chair right here at a fraction of the price.